After heading back home from the incredible Concours of the Americas at St. Johns, and settling in to review the hundreds of photos I took, it struck me what an incredible showfield it was. It’s a tough choice where to begin reviewing this event, so I decided to start at an unusual place – certainly not the flashiest or most famous entry onsite – but one that was beautiful with an incredible story and a strong connection to the Motor City. The Raymond Lowey designed Hupmobile Aerodynamic is also called the Series 527 and it rides on a 127″ wheelbase and is powered by a 120 h.p. straight-eight engine . 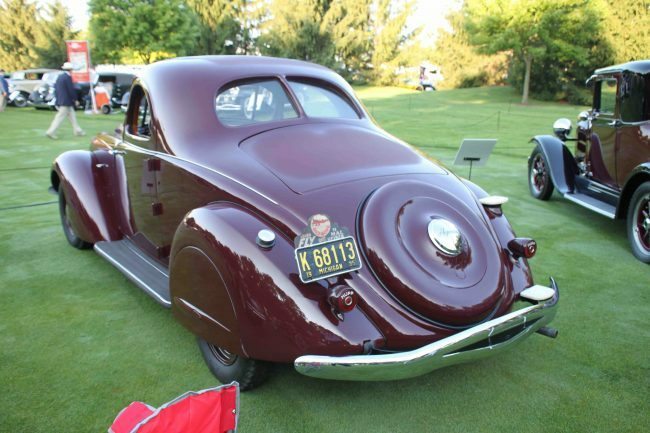 The aero-dynamic body style first appeared during 1934 and was one of the very first in a long line of Lowey’s famous and distinctive automotive designs. Hupmobile produced fine cars in Detroit from 1909 through 1937. Beginning with the Model 20, introduced at the Detroit Auto Show in 1909, the produced conservatively styled, reliable cars for several decades until turning to Mr. Lowey in 1931. The result was the 1932 Hupmobile Cyclefender, a sleek roadster that performed well but sold poorly. 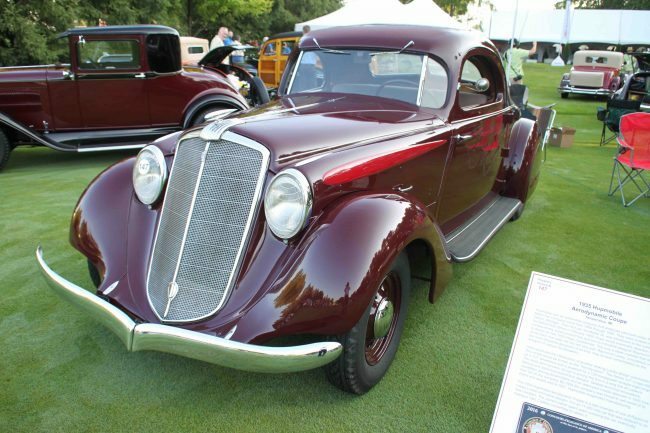 In 1934, realizing their designs were dated, Hupmobile introduced the Aerodynamic coupe, known as the Series 527, with striking European-influenced coachwork. The public loved the semi-recessed headlamps, but the 3-piece windscreen was decidedly panned. Despite the striking design, Hupmobile was in financial freefall, and was forced to sell most of its assets in 1936. 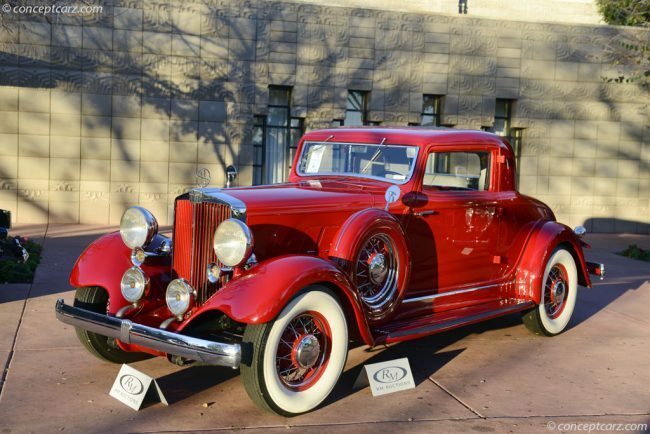 The wonderful piece of Hupmobile history shown at St. Johns is as stylish as a car can get. This 1935 Model J-527 Aerodynamic coupe features a sharp “V” style front bumper and fender flared headlights that take the Art Deco movement to a new level. A massive grille set off by the rocket inspired Hupmobile hood ornament completes the look of a front end that is unlike any other car of the mid-1930s. The aerodynamic theme is also carried over into the front windshield, which is styled with three separate windows. At the rear this Aerodynamic coupe features a rumble seat with passenger side step plates and an integral continental spare tire that gives it a true classic look of sheer elegance. Color keyed rims and black wall tires complete the beautiful lines of this coupe, which is finished in a lovely shade of maroon. 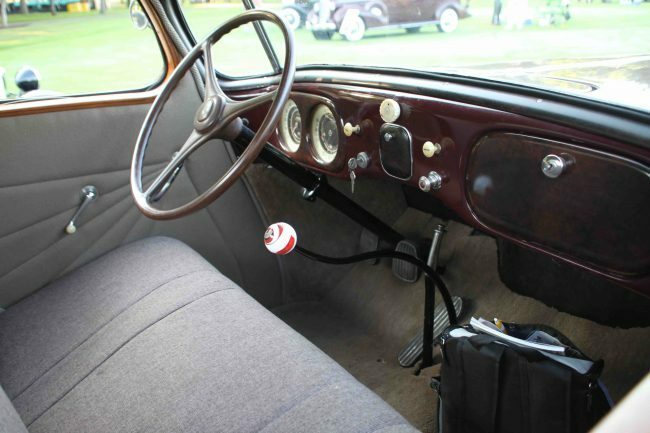 The interior of this Aerodynamic is nicely finished in leather with a wonderfully simplistic design that only a car of the 1930s could possess. Instrumentation is housed in two dashboard nacelles that are elegantly styled and easy to read. 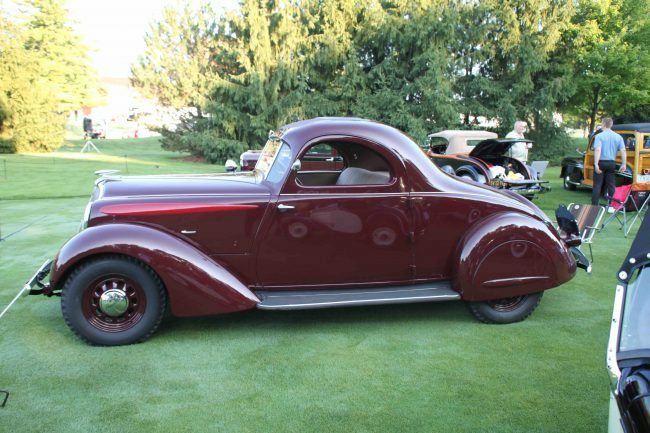 This lovely 1935 Aerodynamic was photographed at the 2016 Concours of the Americas at St. Johns, and it’s a rare surviving example, with just 11,000 miles from new. The current owner spent years pursuing the car, eventually trading a 1941 Cadillac convertible to obtain it. Hupmobile continued on for just one more year, and was completely out of the automobile business by 1937. If you have a Hupmobile or another collectible you’d like to insure with us, let us show you how we are more than just another collector vehicle insurance company. We want to protect your passion! Click below for an online quote, or give us a call at 800.678.5173.